A call to Niel Gow at Thierry Voisin brings the news that Thierry has signed the 28.9m motor yacht Red Sky for sale. Red Sky was delivered by Couach Yachts in 2002 and sleeps nine guests in four cabins. Professionally maintained by a full-time captain, this superyacht is commercially registered and her twin 1500hp MTU engines give her a cruising speed of 21 knots. 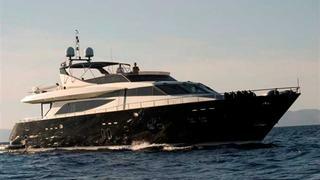 Red Sky's 40m berth in Menton is also for sale either as part of a package or by separate arrangement asking €1 million. The yacht's asking price is €2.2 million.